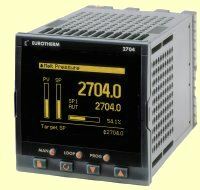 2600 Specifications Eurotherm Controls and Barber-Colman announce a new member of the Series 2000? family of controllers, the Model 2604 (1/4 DIN) high stability Pressure Controller and the 2704 (1/4 DIN, graphical display instrument), perfect for plastic melt pressure applications. Strain gauge inputs can be energized from an internal 5 or 10-volt transducer excitation DC supply on the 2604 or 2704. The high speed, 5 digit controller is equipped with a precision melt pressure control algorithm and includes an automatic calibration routine to remove zero and span offsets. 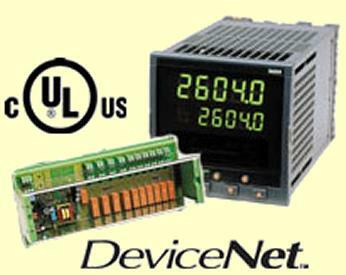 The 2604 and 2704 are available with Modbus, PROFIBUS, or DeviceNet communications. 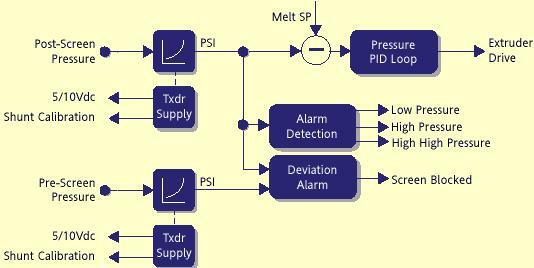 These controllers are ideal for connection to PLC® or PC based systems in which the security and high accuracy of an independent melt pressure controller is required. The 2604 and 2704 can support up to three loops of control. This permits a variety of control strategies that are all capable of being created and "cloned" with the iTools software package.